Sifneos swept in Rino Anto’s cross to give the home side the lead in the 14th minute. It was Dimitar Berbatov, stellar on the night with his incisive passing from midfield, who threaded a pass through to Anto. The right back didn’t make any mistake in picking out Sifneos, who steered the ball past Amrinder Singh in front of a delirious Kochi crowd. And just when it seemed Kerala had done enough to record their first win of the season after two 0-0 draws in a row, Balwant Singh thumped in a low cross from Everton Santos in the 77th minute. It was a game of missed chances and drama in front of goal as Santos’ shot was brilliantly saved by Paul Rachubka onto the woodwork and CK Vineeth was sent off in the dying minutes after a second yellow card for diving. The Blasters had made their intentions clear from the start when Courage Pekuson dragged his shot wide from outside the box in just the fourth minute. Within the next 60 seconds, Kerala sent in a series of crosses from both sides, but Mumbai somehow withstood the storm. After taking the lead Kerala Blasters continued attacking. Jackichand Singh found CK Vineeth with a long ball but the forward’s brilliant turn and shot was saved. Jackichand was the receiver in the 43rd minute when Berbatov found him with an inch-perfect lobbed through ball but the winger blazed it over despite having options in the middle. Squeezed between these two chances was Mumbai City’s only meaningful attempt on goal when Rafa Jorda headed Abinash Ruidas’ cross straight to the ’keeper. Berbatov, who had done most of the passing for Kerala Blasters, had his own attempt when his header from a corner flew straight to Amrinder at the stroke of half-time. The home team started the second half just like the first when Pekuson blasted his shot over from a tight angle and so did Vineeth when Lalruatthara’s cross found him at the far post. Balwant had another chance as the game opened up in the last 10 minutes, but his first-time shot from a clever flick in the box petered out of play. 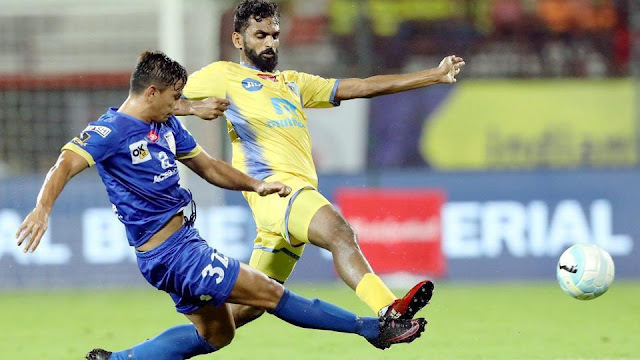 The Blasters, despite being down to 10 men, pushed bodies forward but Mumbai City held on to a draw with Berbatov shooting over the bar with virtually the last kick of the match. The point takes Mumbai City into sixth position and Kerala Blasters to seventh in the ISL standings.